>Firefox 4.0 Beta 1 includes some new web developer tools, “Console” and “Inspector”. This post will cover the Console, what it does now and the direction we are headed with it. The developer tools team would like feedback from web developers and others who might use these tools, so please try it out and either comment in Bugzilla, through one of our feedback tools (such as http://www.mozilla.com/firefox/beta/feedback ) or in the comments of this blog. The Meta Bug for this Console work has a list of blocking bugs, for those who are interested. The console displays log messages, warnings and errors that originate in web pages. The current Error Console in Firefox displays messages that originate in any open web page, Firefox itself and the underlying Gecko platform code. One of the main changes we wanted to make with the new Console was to pre-filter all of the messages so you are only seeing messages that originate in the current browser tab. You can activate the Console though Tools menu -> Heads Up Display. (The “Heads Up Display” name will be changing soon to something like “Console”). The existing Error Console is displayed in it’s own window, the new Console is initiated per browser tab, and is displayed (by default) as a panel that drops down over the corresponding tab’s web page. You can open the console for each tab if you want to. Each will funnel console messages about that document to the correct console. Now that we are tying the log messages directly to each tab, there is a lot higher signal to noise. This is, of course, a work in progress. There are a couple of bugs that need to be fixed before all of the messages are properly identified as being from a particular tab: bug 568034 and bug 567165. Another goal is a rich, interactive (command line) interface that allows quick introspection of JS Objects you might be interested in. You can execute functions, write code directly into the console command line and the output displays the result of the executed commands. We want the command line to be a very powerful tool for users to quickly find out the state of variables and the effects of function execution. There are several bugs on tab-completion, JS object inspection and helper functions, which are under heavy development right now and should be available in upcoming betas. Tab completion in the command line interface will allow you to easily introspect the properties of various JS and DOM objects. Helper functions in the command line will allow developers to have a “$” function regardless of whether a “$” function is already defined. If defined, nothing happens and the developer can use her existing function. If not, we provide a “$” that does document.querySelectAll, among other things. The console work is just getting started. The recent addition of some additional engineers means we will be iterating quickly, so please check it out and give feedback often. You may want to use a nightly build for bleeding edge features. I will post additional “branch” builds to this blog as they are available. The existing errorConsole in Firefox has messages sent to it that do not know what tab the error originated in. We really want to isolate all messages you see to the tab you care about as a web developer. It becomes tedious to try and watch the scrolling messages at times if a “noisy” page is loaded in one of your 200 open tabs. 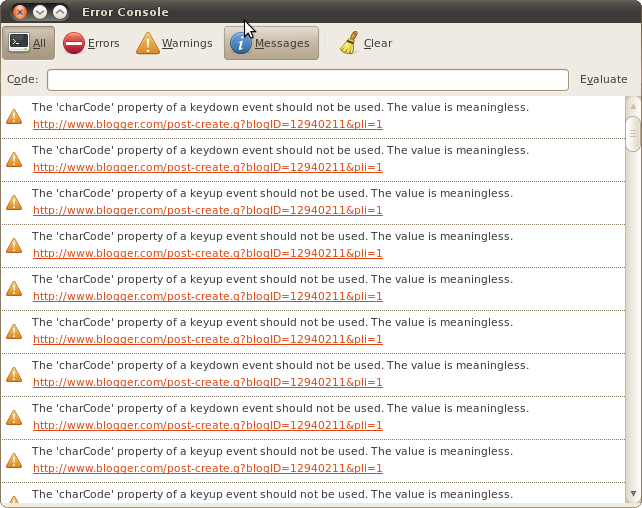 So you will notice that not all errors are displayed in the console. In Firefox, images are loaded differently than script, css and html pages, so much so, that it is difficult to trace these image loads back to the originating tab as well. Once these two bugs are fixed, your console messages will be very accurately focused to the tab you care about. The console itself has the standard API: console.log, console.info, console.warn and console.error. This initial landing into Minefield nightly will hopefully generate some valuable feedback from web developers and Mozilla developers alike. Please do not hesitate to comment here or even better in bugzilla. Have a few issues trying to get image loads to log to the correct console. bz is helping me figure out these crazy HTTP load issues. wow – the try server does debug builds now, cool. Spent some time talking with jimb and sayre about how the console and debugger will fit together and what kind of user experience we are thinking about for the debugger, which has to be GREAT. Signed up robcee and myself to do a science fair exhibit on DevTools at the Summit. I plan on utilizing my charcoal grilling apparatus at some point this weekend. >Much more work on bug 534398 – Found some issues with correlating network traffic with correct HeadsUpDisplay, mostly network traffic where the request is an ImgRequest. I have been getting advice from bz and dougt. This means that the console does not log any network traffic where an image or favicon is loaded. I have most of the filtering working, there are some bugs with the “binary” on/off filters and I am almost there with the string filter. I should have those sewn up on Monday, and a patch for review by Tuesday midday. Nail down filtering, ask for review, (any takers? ), fix all tests and write a few new ones. New try build and a blog post. Platform attention on bug 567165. It would be great to be able to get the “contentWindow ID” in each content JS and CSS consoleMessage. That would make message isolation (to a tab) “easy”. >”Heads Up Display” bug 529086 Added properties file and stringBundles to source files that do UI stuff. All strings are L10N ready, adding more will be trivial. Looks like I have coerced mrbkap for a first-round review – “next week”. Will spend some time Monday updating the wikipage and milestones with time estimates and what a first-landing looks like. More filtering work as this is going to be tricky to turn certain behaviors on and off. I continue to do clean up and make sure code is adhering to the style guide. Would love some feedback on bug 561458 about how the UI is initiated and applied to the browser. Overlays are pretty much out – I think. I will create a new try build as soon as the filtering is working properly. Implemented DOM Mutation logging as well as more concise network logging. Removed all programmatic CSS and started using the css service. Tweaked the UI to make it more “usable” while under such heavy development. Need to make each logged message “updatable” by asynchronous but related log messages. Also need to add an exception listener that can log to the corresponding tab’s “Display”. Add preferences for turning on and off functionality, etc. Slowly breaking things out into smaller, stand-alone and tested modules or additional services (maybe) – to make review easier. Need to get feedback and start reviews on the various bits: HUDService, HeadsUpDisplay module, storage module, JSTerm module.